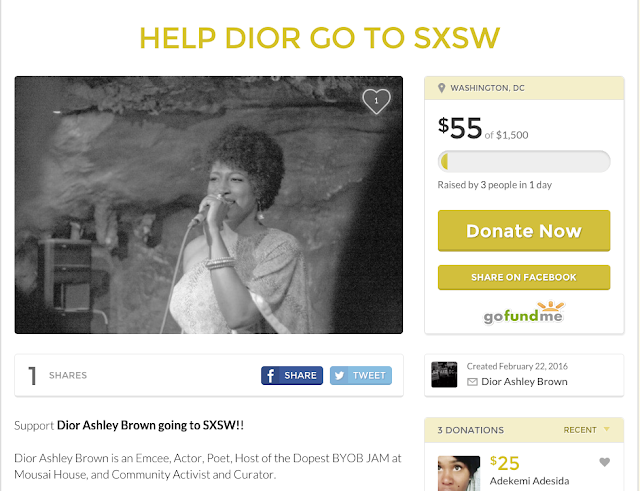 Dior Ashley Brown EMCEE: Support Dior Ashley Brown going to SXSW!! Support Dior Ashley Brown going to SXSW!! What's Up Fam!! Help me my goal by March 9th! Dior Ashley Brown is an Emcee, Actor, Poet, Host of the Dopest BYOB JAM at Mousai House, and Community Activist and Curator. Family! I appreciate You! You have been there to encourage my journey and support my evolving! Continue to help me build our network and thrive, by adding your donation. As a Partner in the Mousai House, I plan to connect with with Artisans building artistic communities all over the states to create bridges. Getting them hip to the treasures we 've got going in here DC in our arts collectives. I'm going to Represent at SXSW with the Holistic HipHop Collective, we are going to travel across country to takeover the SXSW festival. Currently, there are 7 acts with more than 18 artists travelling from the DMV for these concerts. We are seeking our fam support, as well to help us get to Texas and back home, along with lodging stay.